This Green Power Soup is a heart-warming version of a high-nutrient green juice. 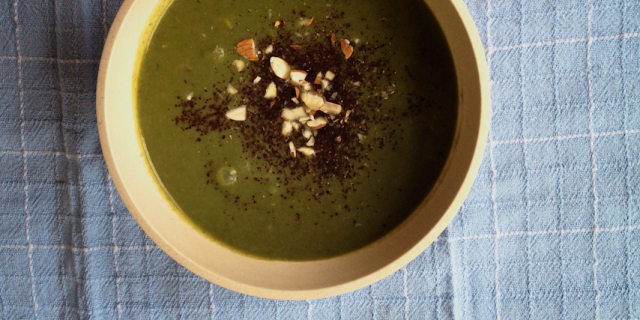 This Green Power Soup is a heart-warming version of a high-nutrient slow-pressed green juice. When it’s this cold outside, I find it hard to stomach a cold, green juice. But I don’t want to go without that super plant power of a great green juice either. So here’s an heart-warming green power soup that will not only keep you warm on a cold day but will help feed every single cell of your body and eliminate waste. I have used spinach and broccoli in this one but you can add kale, Swiss chard, purslane or any other green leafy vegetable to your taste. Want to know more about the super power of green leafy veggies, read more here. Heat oil in a large saucepan. Sauté shallots until soft for about 5 minutes. Add garlic and ginger, cook for about 2 minutes. Add in vegetable broth, cauliflower, broccoli and the chilli powder. Bring to a boil, lower heat and allow to simmer for 10 minutes, or until vegetables are cooked. Add spinach and gently cook for about 4 minutes. Add in coconut milk and basil. Cook on a low heat cook for another minute. In a high-speed blender, blend soup until silky smooth.